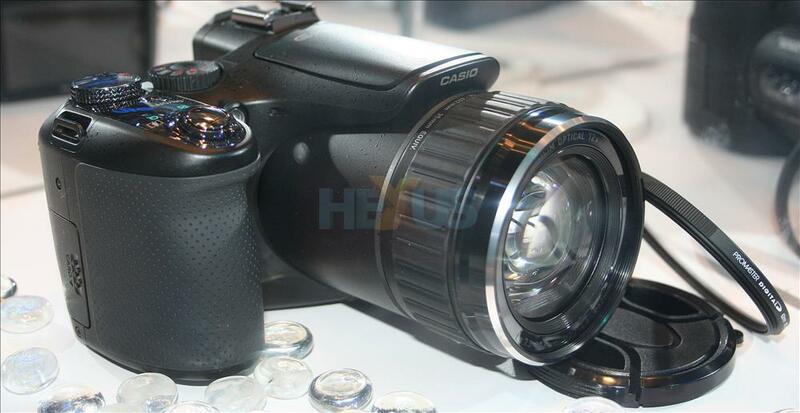 The Casio EX-F1 looks like an innocuous high-end camera on first glance, right? Its party trick is the ability to take pictures quickly - really, really quickly. Using an intelligent burst mode, the camera can take 60 full-resolution (6MP) pictures in a second! We were told that the logic uses proprietary technology that actually begins shooting a scene before you press the button. You'll need an extra-fast card to keep up with the burst mode, however. In addition to high-speed static-mode shooting, the EX-F1 is also able to record VGA-quality (640x480) video at an astounding rate of 300fps. Indeed, representatives were keen to point out that it's possible to set the camera to a 1,200fps at a lower resolution for real slow-motion shots. The EX-F1 ships with a 12x optical zoom, 2.8in LCD will cost $999 and be available in around two months. Handy for folks that indulge or shoot action sports and want to capture fast-moving action in detail.